Home / Tensar Corp Blog / How Stiff are Tensar TriAx Geogrids? See for Yourself. Compared to other geotextiles or flexible grids, Tensar Geogrids spread road loads over a wider area of subgrade, lessening the impact of heavy loads and reducing installation and maintenance costs. This is due to the greater stiffness of Tensar Geogrids. This stiffness helps create an enhanced “snowshoe effect” over soft subgrades and just one of the many reasons why they are more effective at confining overlying granular fill. How does your geosynthetic material compare? Take a sample of Tensar® TriAx® Geogrid and place it over the mouth of a coffee cup. Press down and feel the resistance. 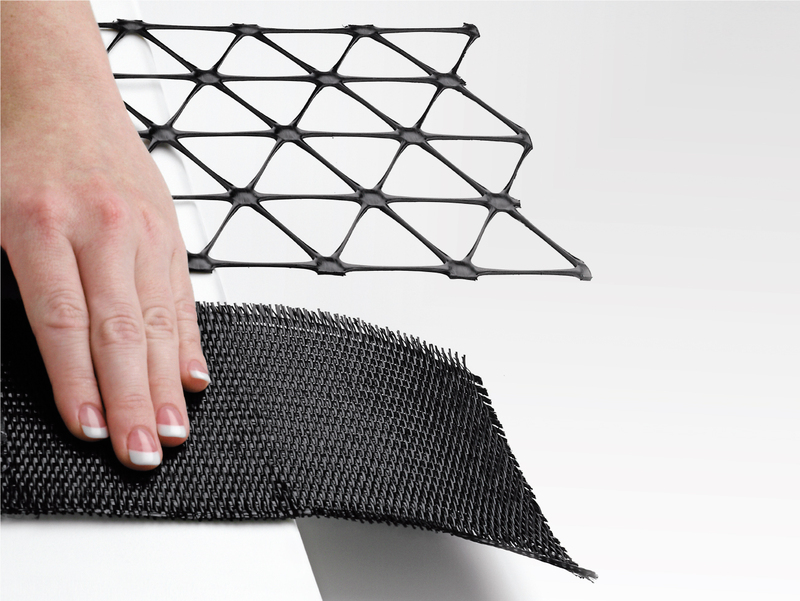 Then try that with a flexible grid or any geotextile. You can feel the difference. Now just imagine the support that Tensar TriAx Geogrids provide when placed on soft soils. Take a piece of fabric and a piece of Tensar TriAx Geogrid. Push them over the edge of the table, as illustrated. The TriAx Geogrid does not sag. It is much more rigid than the geotextile. That stiffness strengthens the performance of Tensar TriAx Geogrids. Stiff geogrids create a “snowshoe effect,” spreading the load over a wider area of subgrade just as a snowshoe spreads a person’s weight over soft snow. It’s easy to claim a product performs “just like” Tensar Geogrids but actually proving it is a whole different job. Ready to talk to someone about Tensar TriAx Geogrid?